38oz. boiler capacity, makes 16, 2oz. handles. Volt 110. Watts 1000. PPG-16 Makes 16, 2oz. cups of espresso. Leaders in domestic machines, the Europiccola and Professional represent a co-ordination of elegance, quality and reliability; manufactured since 1961, these machines will never be out of fashion; the Professional is exhibited in the Museum of Modern Art in New York. Dual frothing cappuccino system. Mounted pressure gauge. Internal thermostat to control pressure. Makes one or two cups at a time. Internal re-set fuse in case of overheating. Nickel plated, solid brass boilers. One year warranty and demonstration video included. ETL listed. Volt 110, Watts 1000 Weight, 16 lbs. Height 12" Made in Italy. 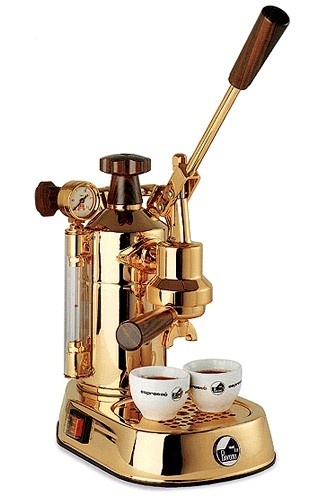 Click the button below to add the PPG 16 La Pavoni Professional Gold Plated Made in Italy to your wish list.